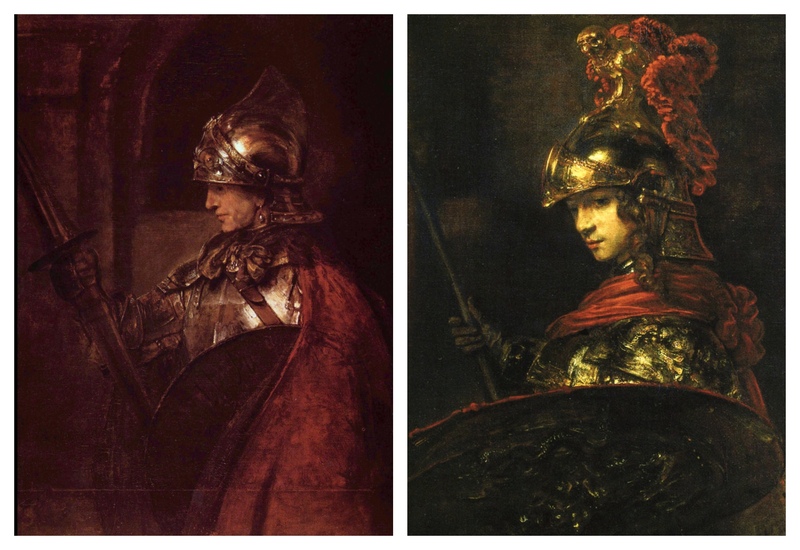 Two quite similar paintings by Rembrandt, now in Lisbon and Glasgow but both painted around 1655, depict figures in armour with uncertain titles and identities. One (right) is now called Minerva because she has long, curly hair and the owl on her helmet is the goddess' symbol.1 Still, to me, she looks like a male youth with signs of hair on her upper lip. The other looks visibly male. Once described as Alexander the Great, it is now called Man in Armour.2 Yet contrary to conventional belief in the significance of narrative these two contemporaneous images are so similar in form that their meaning must be too. L: Rembrandt, Man in Armour or Alexander the Great (1655) Oil on canvas. Kelvingrove Art Gallery and Museum, Glasgow. 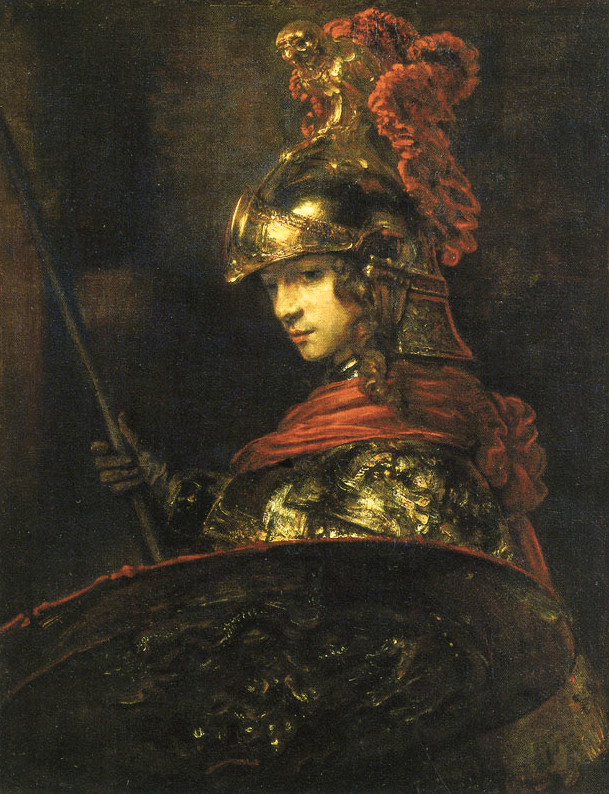 R: Rembrandt, Minerva or Pallas Athena (c.1655) Oil on canvas. Calouste Gulbenkian Museum, Lisbon. For starters, all followers of the Inner Tradition in any of its many forms over the centuries has sought Wisdom which in its pagan paths is just another way of saying God. Attaining a state of pure wisdom or unity with God were similar. 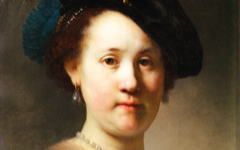 Indeed Rembrandt who sought wisdom, or understood the process like all great poets, was one of them, seeking to discover in his own soul that divine element that makes us both fully human and God-like, at one with nature and divinity. The wise owl then is likely to represent the perfection and purity of the artist's mind, no matter whose head is in the helmet. 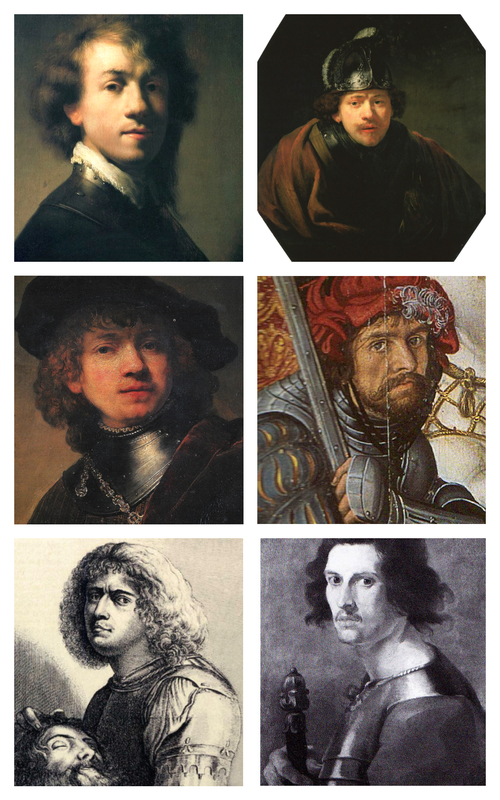 At left are six self-portraits in armour, the first three by Rembrandt and all painted before 1650, the date of the two paintings in question. 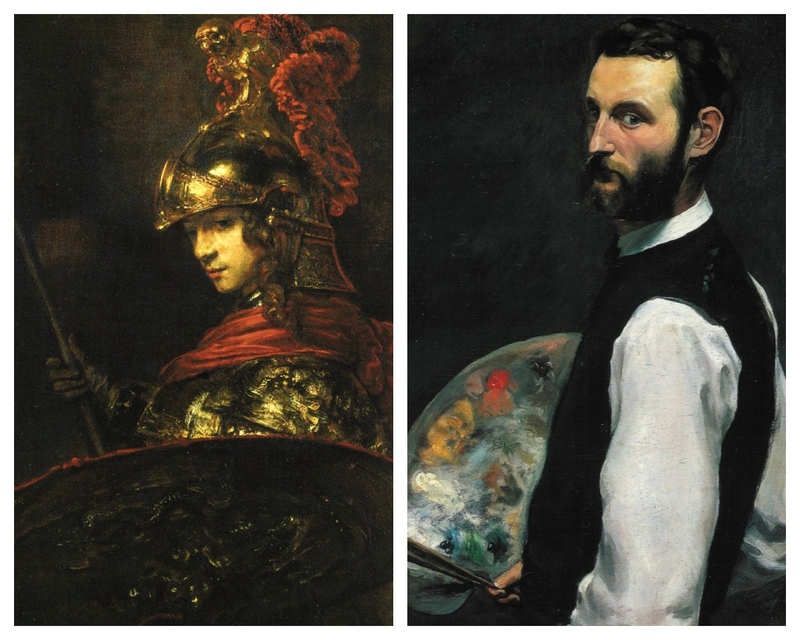 Little-known by anyone but artists, visual poets like the artists at left had long imagined themselves as creative warriors armed and ready for battle. Armor also reflects like a mirror, yet another metaphor for the reflective mind. In both pictures the smooth part of the helmets suggests an eyeball thereby combining mind with vision. In Minerva the owl sits on that "mind-eyeball" or inner eye. Moreover, if you click on the image to enlarge it, you will see the bird reappear in the other helmet directly above the man's thoughtful eyes. He, too, is a representation of the thinking artist so that, in both pictures, the wise owl rises from an inner "eye", linking inner vision with wisdom. Diagram indicating how the owl on the helmet of Minerva reappears as part of the helmet's pattern in Man in Armor. 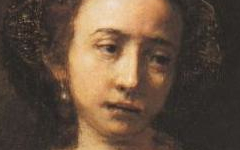 Thus, I believe, that the artist's search for true knowledge, and his recommendation that you, the insightful and thoughtful viewer, follow it, is the principal subject of both paintings even if, as in so many other examples on this site, their narrative content differs. Great art, one should also remember, is not painted for the masses but for other great artists and, should you choose to think like them, for you as well. 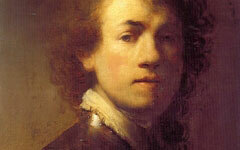 Scholars have sometimes wondered why the young Rembrandt painted himself wearing a gorget, the metal collar worn by soldiers of the period, when he himself was never in the military. 1. An alternative title for Minerva is Pallas Athena. 2. Other heroes have been considered as well. Original Publication Date on EPPH: 28 Jul 2013. © Simon Abrahams. Articles on this site are the copyright of Simon Abrahams. To use copyrighted material in print or other media for purposes beyond 'fair use', you must obtain permission from the copyright owner. Websites may link to this page without permission (please do) but may not reproduce the material on their own site without crediting Simon Abrahams and EPPH.